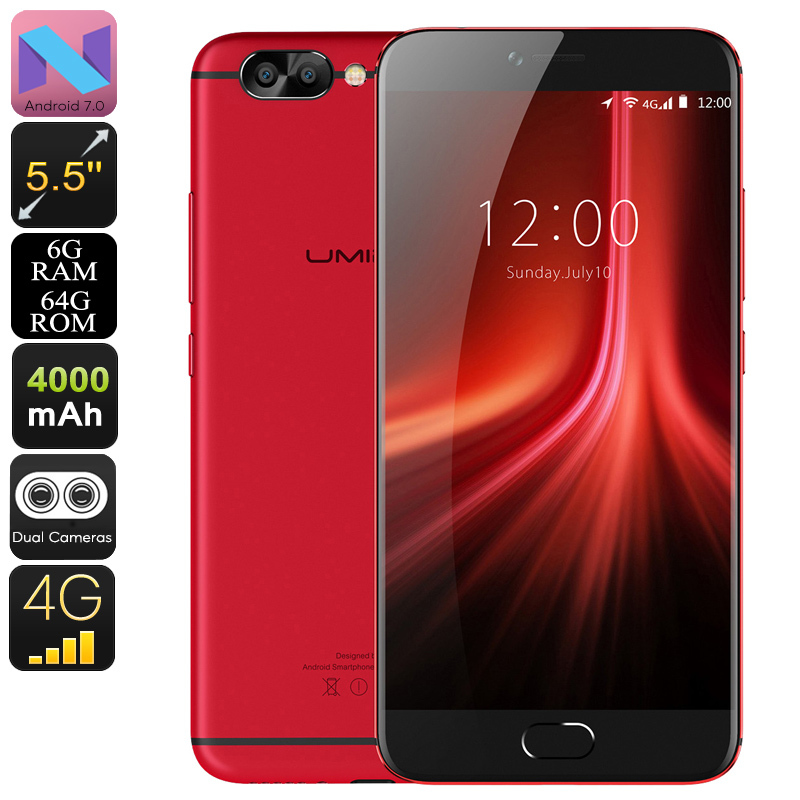 Successfully Added HK Warehouse UMIDIGI Z1 Pro Android Phone - Android 7.0, Helio P20 CPU, 6GB RAM, 1080p, 4000mAh, Dual-Rear Cam (Red) to your Shopping Cart. Meet the UMIDIGI Z1 Pro Android phone. By being word’s thinnest big battery smartphone, this beautiful cell phone brings along a stunning 20 hours of continuous usage time. All this power is generated by its whopping 4000mAh battery. With their latest Android Phone, UMIDIGI has managed to create an Android device that most smartphone users are longing for. This is a beautiful phone with an ultra-sleek body that packs a huge battery and powerful hardware. It outperforms most of its competitors and comes with an unbelievably low price tag. This Android smartphone certainly has deserved to be called China’s latest flagship killer. Besides its epic battery, this Android phone holds the MTK Helio P20 processor. With its 8 cores, this chipset has been clocked at 2.3GHz. Thanks to this, it is capable of bringing forth a powerful yet energy efficient performance. You’ll be able to enjoy the most demanding features the industry has to offer without dropping a frame. Along with an unbelievable 6GB RAM, this Android phone supports excessive multitasking sessions. No matter what you throw at this smartphone, nothing will slow it down. You’ll furthermore be treated with 64GB of internal memory. For those of you that need even more storage, the Android phone supports a massive 256GB SD card slot. At the rear of this flagship smartphone, you’ll be able to find a 13MP Dual-Lens camera. This professional piece of equipment allows you to shoot stunning photographs and 4K video. The cell phone has furthermore been equipped with a 5MP front snapper. This cam is perfect for taking selfies or for engaging in Full-HD online video calls. Thanks to its massive storage capacity, this Android phone holds enough memory for all your pictures and videos. All these files can be accessed easily with the simple touch of a finger thanks to the phone’s ultra-fast fingerprint scanner. With Dual-IMEI numbers, the UMIDIGI Z1 Pro lets you be reachable on two phone number simultaneously. It furthermore supports 4G connectivity and Dual-Band WiFi. Thanks to this, you can always browse the web at lightning speeds. Whether you’re at home, in the office, or traveling abroad – with this Android phone you’ll always stay connected. You’ll furthermore be able to play online games and stream movies in the blink of an eye. These can be enjoyed on the phone’s stunning 5.5-Inch FHD display that supports 1080p resolution. This screen has been equipped with tough Corning Gorilla Glass 4. Therefore, you no longer have to worry about accidentally damaging your display during the day. This UMIDIGI Z1 Pro comes with a 12 months warranty, brought to you by the leader in electronic devices as well as wholesale electronic gadgets..